All students should come to the studio at least 5 -10 minutes prior to the beginning of their class, change and be ready to start on time. The 5th Sunday and Thursday of the month. 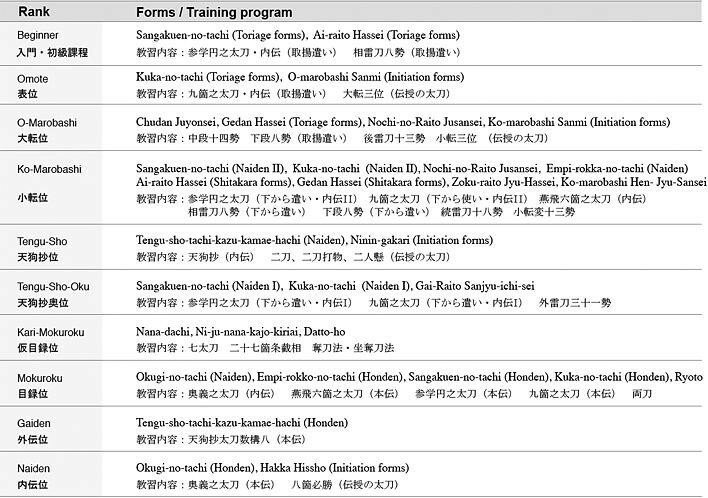 Shinkageryu Hyoho Marobashikai does not adopt the modern "Kyu and Dan" or " Belt Color" ranking systems instead following the traditional kenjutsu ranking system. There are ten ranks in the Marobashikai. All members are expected to practice all Shinkageryu forms as they obtain a given rank. Generally, the forms become more sophisticated as the student advances. Each ranking stage requires the attainment of certain standards and the acquisition of certain techniques. The following chart indicates forms, practice levels, and ranking stages (In order of lower to higher levels).